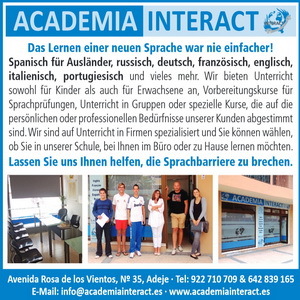 Spanish for foreigners, Russian, German, French, English, Italian, Portuguese and much more. 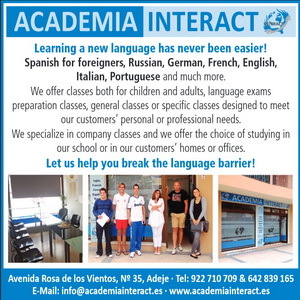 We offer classes both for children and adults, language exams preparation classes, general classes or specific classes designed to meet our customers’ personal or professional needs. We specialize in company classes and we offer the choice of studying in our school or in our customers’ homes or offices. Let us help you break the language barrier! 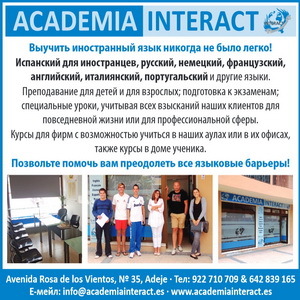 This is a Yellow Page entry for the company Academia Interact in the branch and in the region Tenerife. Produced with news.CMS in 0,0698 seconds.